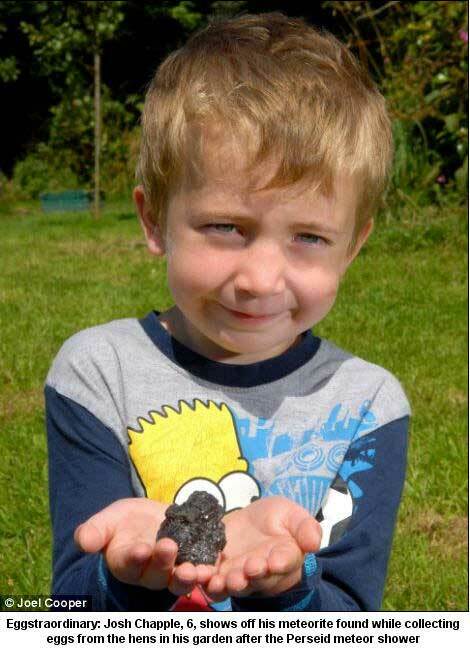 A six-year-old boy who had gone to collect eggs from his family's brood of hens was stunned to discover a rare meteorite in his back garden instead. Josh Chapple discovered the egg-sized find the morning at the family home near Barnstaple, Devon after the Perseid meteor shower last week. The unusually large rock measures 6 x 4cm and is black with a shiny crystal-like gleam. Josh, who found the rock last Friday, told how he first thought his discovery was a lump of coal. He said: 'I saw it on the ground near our back door - there were burn marks all over it. Mother Sarah Chapple, 36, had planned to stay up and watch the annual meteor shower but couldn't see anything because it was overcast. She said she knew at first glance the rock wasn't coal so went on the internet to investigate. 'We found pictures of meteorites that had been found elsewhere in the world - they looked just like the rock that we had found,' she said. 'I had thought to keep an eye out for shooting stars but it was far too cloudy and there was nothing to be seen. Josh's father Andrew, 34, added that both their other sons, Aiden, 13, and Kai, 11 were thrilled about the find. He said: 'Josh is so excited, it's quite incredible really and it's exciting to think how far the rock has travelled. But it looks unlikely that the family will profit much financially from the discovery. 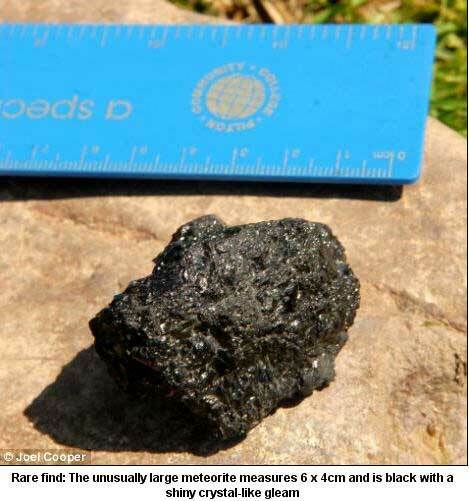 Mr Chapple said: 'We looked on eBay and there were people selling bits of meteorite off. 'One bloke in Mexico was selling it in slices for £15,000 a go - the boys were saying "Dad can we buy a racing car?" The Perseid meteor shower is so-called because the point they appear to come from lies in the constellation Perseus. Astronomers say up to 100 meteors per hour - looking like shooting stars - appeared across the sky during the shower's peak last week.